The HANNA dissolved oxygen portable test kit can determine the oxygen concentration in water quickly and easily. A modified Winkler method is used. Manganous ions react with oxygen in the presence of potassium hydroxide to form a manganese oxide precipitate. An azide is present to prevent any nitrite ions from interfering with the test. On addition of acid, manganese oxide hydroxide oxidizes the iodide to iodine. Since the amount of iodine generated is equivalent to the oxygen in the sample, the concentration of iodine is calculated by titration of thiosulfate ions that reduce the iodine back to iodide ions. 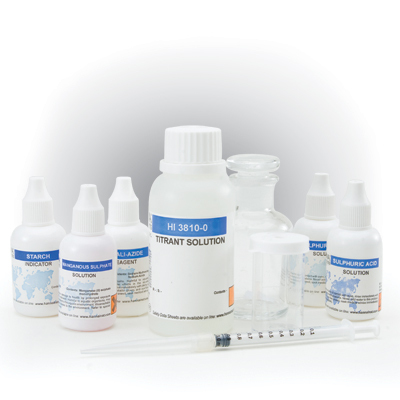 HI 3810 test kit comes with 30 mL manganous sulfate solution, 30 mL alkali-azide reagent, 60 mL sulfuric acid solution (2), 10 mL starch indicator, 120 mL titrant solution, glass bottle with stopper, 10 mL calibrated vessel and calibrated syringe with tip.